The Supreme People's Court will set up the first international commercial court in Shenzhen in South China's Guangdong Province and the second international commercial court in Xi'an, capital of Northwest China's Shaanxi Province, to settle cross-border commercial disputes in the Belt and Road (B&R) initiative, China Central Television reported on Wednesday, citing a notice issued by the State Council, China's cabinet. The settlement will follow four principles, including jointly discussing and developing and sharing of the mechanism, handling disputes in a fair, efficient and convenient manner, respecting the autonomy of the will of the parties, as well as diversifying methods of dispute resolution, the report noted. 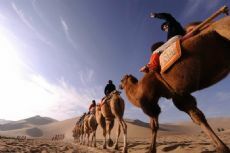 The plan to establish a mechanism to legally resolve trade and investment disputes arising from issues related to the Belt and Road initiative was approved during the second meeting of the Leading Group for Deepening Overall Reform of the 19th Central Committee of the Communist Party of China in January, the Xinhua News Agency reported.